One of the biggest benefits of the Vortex Razor Red Dot reflex-style sight is that the dot remains incredibly bright in all kinds of conditions and backgrounds. 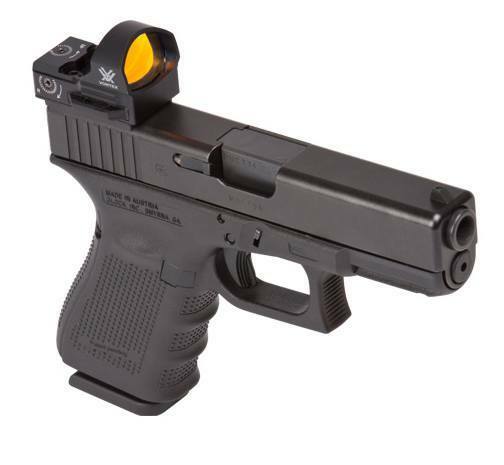 The Razor Red Dot can be used on a pistol or an AR-style rifle. If going the latter route, you will be able to use the optic as an offset-mounted sight that sits side by side with your primary site. The glass used in the sight is highly polished an about as clear as it gets, which translates to a wide field of view. Premium coatings, including ArmorTek have been used on the lenses deliver a durable coating. The sight offers unlimited eye relief and is parallax free. The dot brightness and On/Off controls are shielded, yet are still easy to access with minimum fuss. The Vortex Razor Red Dot sight comes with a mount that can be used on a variety of weapons. There are also accessory mounts available that make the sight weapon specific. It comes in a col matte-black finish and has a sight cover that protects it from damage while being stored or transported. The optic is shockproof, fogproof, and waterproof, and runs on a widely available CR 2032 battery. You have your choice of 3-MOA and 6-MOA-diameter dot models. Mark Boardman, Marketing Manager for Vortex Optics, believes that the 3 MOA Dot is most suitable to the average hunter, while the 6 MOA dot option is better for those looking at competition pistol shooting and close range work. The Vortex Razor Red Dot comes in with a starting price of around $599.